Nowadays, very many of us know someone with dementia. We know that, as we grow older, it is something that can happen to us. A diagnosis of dementia is not something that should be treated as an instant tragedy. If we treat it in the right spirit, there can be years of enjoyable life ahead. But there will be difficulties. This book aims to tell you more about them, and how you can best cope with them. There are pages of information and advice, each accompanied by a prayer. 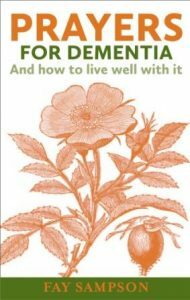 The book is divided into three sections: (1) for, or on behalf of, someone with dementia, (2) for carers, (3) for family, friends and the wider community. One of the most helpful analogies I was given was of the memory as a bookcase. Imagine one shelf for each decade of someone’s life, starting from the bottom. If an earthquake shakes the room, it is the books on the top shelf which will fall off first. Experience and skills learned early in life will last longest. A woman may forget something you told her five minutes ago, yet still be able to play whole piano sonatas from memory. A man who can no longer be trusted to catch a bus alone may yet remember how to drive a car safely, so long as there is someone to remind him where to go. Don’t underestimate someone just because they have dementia. As time goes by, the memory of recent chapters in someone’s life may fade, while they retain a vivid recall of childhood. When we were planning my mother-in-law’s 80th birthday celebration she wanted to invite a cousin who had been a childhood friend. She added: ‘And let’s invite Harry’s mother. It would be good to have some grown-ups there.’ She had reverted to her 8-year-old self. The boundaries between the present and the past fall away. Eventually, that person may truly believe they are living in that remembered past. Yet that past is very precious. People with dementia will each have had a uniquely interesting life. They have had skills, jobs, hobbies, relationships which are too important to be dismissed as ‘living in the past’. These experiences have shaped the identity of that person. It may be helpful to compile a memory file of photos and objects which recall the different stages of that person’s life. It can be helpful too as a reminder of family, friends and colleagues they are beginning to forget. For those going into a care home, it will be useful to provide an information file telling staff about the resident. The care staff may be surprised by their past achievements. It may change their attitude to a vague and shuffling elderly person. I don’t mean to forget things. But I can tell from the exasperation in the voice that I must have asked this question many times. I know they are trying to be kind, but at times I feel like a scolded child. I want to feel valued. The world is becoming increasingly unfamiliar to me. I know I used not to be like this. I used to be in charge of my own life. I didn’t forget to take my medicines or change my clothes. It exasperates me that I can’t remember how to do certain things. I forget the names of my family. It humiliates me. Frightens me. Lord of the eternal years, I can’t even remember what day of the week it is, but you have always known me, from the time I was in my mother’s womb. You number every hair of my head. If I forget everything I ever knew, you will never forget me. Anchor me, Lord, with the grip of your strong hand. When everything else is slipping away from me, hold me fast. you made your disciples face up to the hard facts they did not want to hear. Help me to meet this unwanted diagnosis of dementia in the same way I would any other illness. Give me the wisdom and tact I will need to help the one I love come to terms with this new word in our lives. May the arms of your love, and my own, be there to support and help them as they learn to accept this reality. Grant me the openness to be one who seeks to change popular perceptions by accepting the word ‘dementia’ and speaking honestly about it. Through our lives, may I and the one I care for show others that this is a serious problem, but that there can still be much joyful life ahead for both of us. With your grace, may I, and all the others in this situation, bring this word out of the shadows to be seen as part of the lives of very many people. For many years I have lived with the reality of dementia within the family. At first, people didn’t use this word. It was just one of the failings of old age. Then one of them reached the stage where she needed to be in a care home. Her behaviour became more problematic. We were beginning to understand that dementia was more than just forgetfulness and reverting to the past. Then my husband was diagnosed with the condition. The Alzheimer’s Society were instantly there, providing a course of information and advice for us with other couples in the same situation. I learned far more than I had known before, and received helpful counsel about how to live well with the condition. So often, a diagnosis of dementia is received as though it were in instant tragedy. But the Alzheimer’s Society shows that this is far from the truth. There may be years of enjoyable life ahead for both of you . You will need to understand, to adapt. Things will get more difficult over time. But you can still go on living positively. This book is designed to help you make the most of the time you have. And the greatest support of all is prayer.